Navigate: StoreFront / Wine Club / Join the Antica Napa Valley Club! Join the Antica Napa Valley Club! The most current shipment is shipped upon signing up. We contact club members via email in advance regarding the upcoming shipment, the estimated delivery date and the deadline for any account changes. After the deadline, we cannot change the shipping address or stop a shipment. Members are responsible for all shipping change fees made afer the deadline. In addition to your 10% discount, shipping is included on all orders of 4 or more bottles (excluding Soracco dessert wine) going to one address. If you pick up your club shipment, in addition to the 10% discount, you will receive an additional 20% in lieu of inclusive shipping. Complimentary tour & tasting for four people up to four times per year. 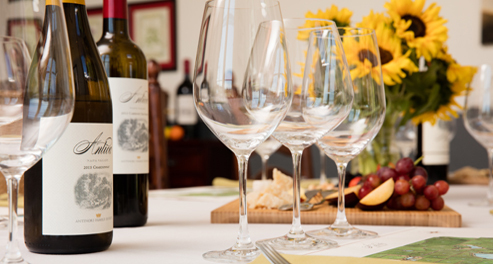 Additional guests receive 50% off the tasting fee. Going to Italy? We facilitate Club Member VIP visits to other Antinori family properties.